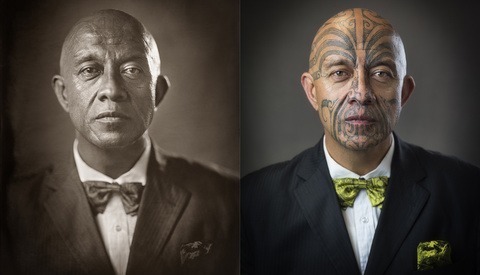 The process of wet plate collodion, commonly known as tintype, is a fascinating one. 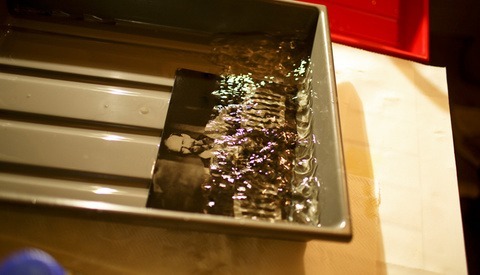 Though many may be familiar with the wet plate collodion process, few have seen an up-close view of it. In his latest video, award-winning wet plate photographer Markus Hofstaetter uses state-of-the-art macro videography to show viewers exactly what is happening with the wet plate chemicals in every stage of creating a tintype photograph. From pouring the collodion emulsion onto a tin through the development and silver bath, viewers are able to see exactly how the chemicals are reacting on a microscopic scale. Part of what makes wet plate collodion photos so beautiful is the use of silver halide crystals, which cause a shimmer, unlike conventional prints. Using macro videography, Hofstaetter is able to show viewers the silver halide crystals up close, and the results are stunning. Being able to see exactly what is happening with the chemical process, Hofstaetter gives viewers who are interested in tintypes an intimate perspective on how the 160-year-old technique works. For anyone interested in knowing more about tintypes, this is a unique way to familiarize oneself with the process and to find new beauty in an otherwise already familiar and beautiful photo style. 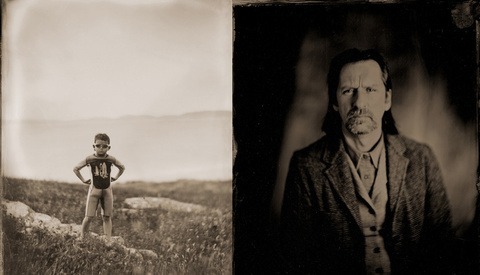 For more information on wet plate collodion photography, visit Markus Hofstaetter's website. This is very interesting and thank you for sharing! One nitpick: wet plate collodion is not also known as tintype. Tintypes use the wet plate collodion process on blackened metal plates, but wet plate can be done on a variety of materials (most notably on glass where they are known as "ambrotypes"). THAT REPETITIVE MUSIC. THAT REPETITIVE MUSIC. THAT REPETITIVE MUSIC. THAT REPETITIVE MUSIC. THAT REPETITIVE MUSIC. THAT REPETITIVE MUSIC. THAT REPETITIVE MUSIC. THAT REPETITIVE MUSIC. THAT REPETITIVE MUSIC. THAT REPETITIVE MUSIC. THAT REPETITIVE MUSIC. THAT REPETITIVE MUSIC. THAT REPETITIVE MUSIC. THAT REPETITIVE MUSIC. THAT REPETITIVE MUSIC. THAT REPETITIVE MUSIC. lol yeah I know! I much would have rather watched those magical macro clips in their entirety without the jarring techno clips interspersed. Oh wow mesmerizing indeed! Thanks so much! Thanks for pointing that out John - this image was just shot with a large soft box and without Scheimpfulg, just to use the footage of making it to combine with the macro shots.